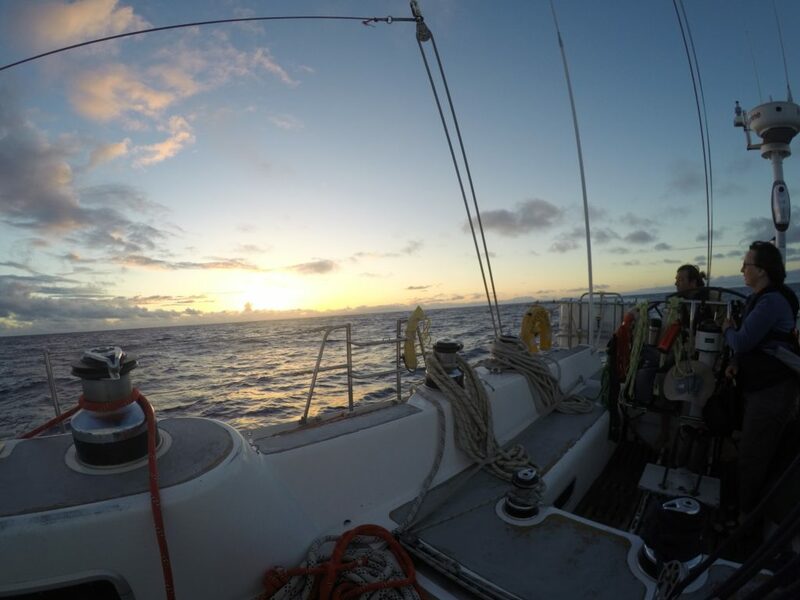 We’ve been experiencing a gentle slowdown for the last few days, the good breeze and powerful sailing angles both easing, to give us the current set of conditions; a gentle breeze well aft of the beam. Disco isn’t the best boat about downwind, especially when under white sails, not quite generating enough power to hold her own against the swell, which then inevitably backs and flogs the sails on each roll of the ocean. Only one thing for it; conveniently bagged and woolled the night before we departed. Yesterday afternoon finally saw a consistent enough wind and gentle swell to create the ‘perfect’ spinnaker conditions. 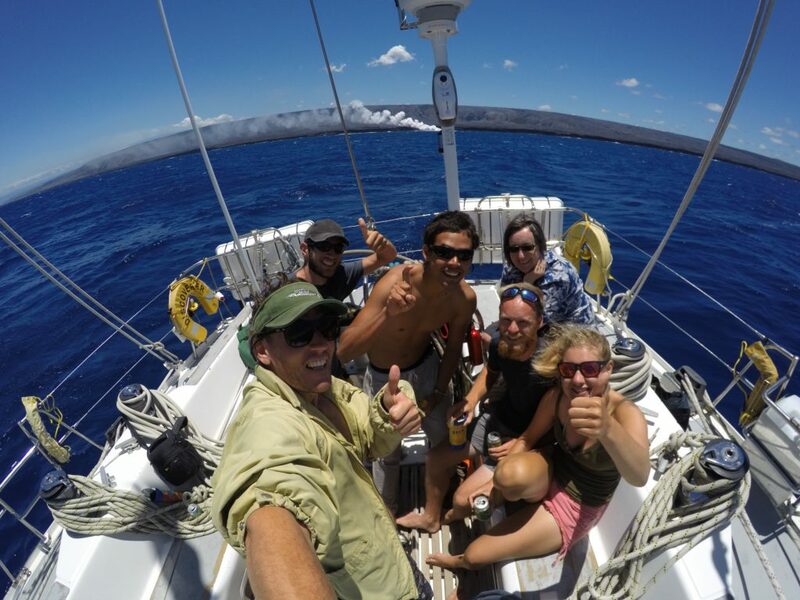 Having not had the kite up since the Caribbean days of fast, fun sailing to Panama, it took a little while to prize the pole off the deck, dig out the sheets, guys, and re-run the many bits of string required down the length of the boat. All set, the pole hoist began. This was soon arrested by the gently panicked tones of Renaud shouting “wait wait wait!” as he realised, just too late, that his life jacket inflation toggle was being hoisted aloft also. Pole lowered, the brightly inflated Frexican made his way back down the boat, much to the amusement of everyone else. Seconds later, as his AIS beacon began its transmission, our nav system alarm went off to inform us that Renaud was now a MOB (man-overboard), and would we like to track his position. 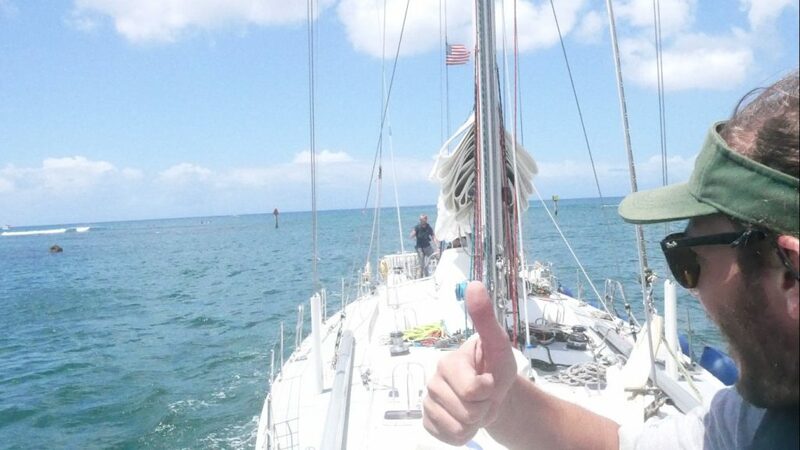 Confirming with Renaud that he was in fact still onboard and intended on staying there, we cancelled the MOB alarm, admonished him for interrupting such a good spinnaker hoist, and continued on from where we left off. 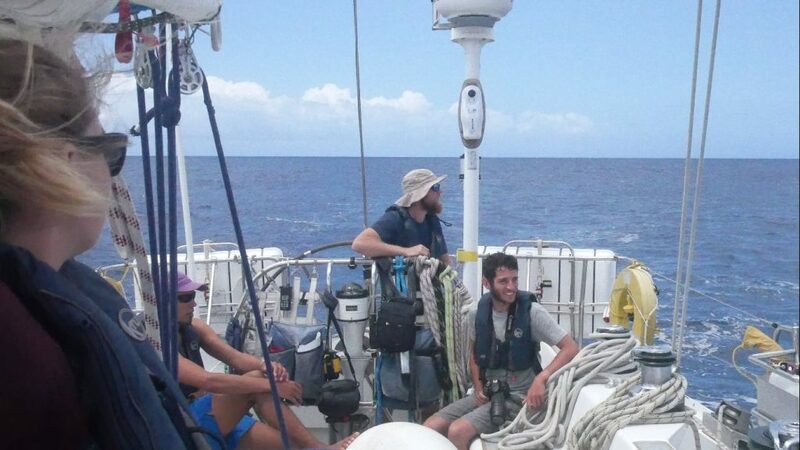 One quick hoist later, and Jetsam was flying, and we were back on course doing well over 8kts again. Finally, making proper progress again, and so much more fun. 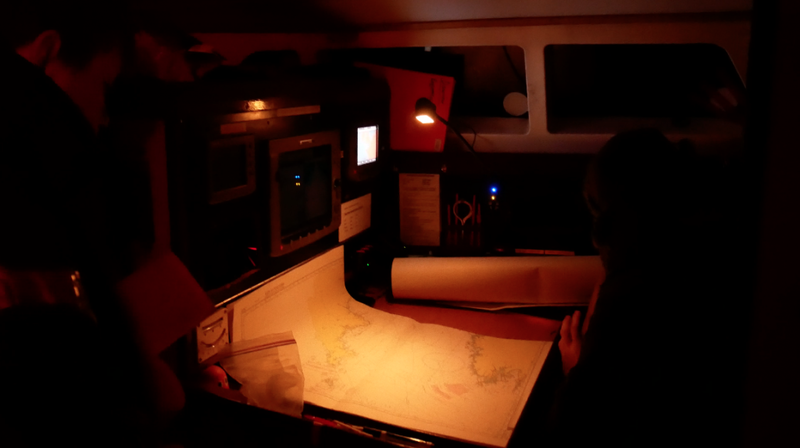 The night was less smooth, with highly variable winds making helming a real handful. This has been more of a problem with the mainsail backing and refilling on the larger swells, without enough pressure to keep it full. This creates the distinctly unpleasant effect of slamming the canvas side-to-side within the depth of its cut, all that load being transferred into the rig, and then the boat, with everything violently shaking. 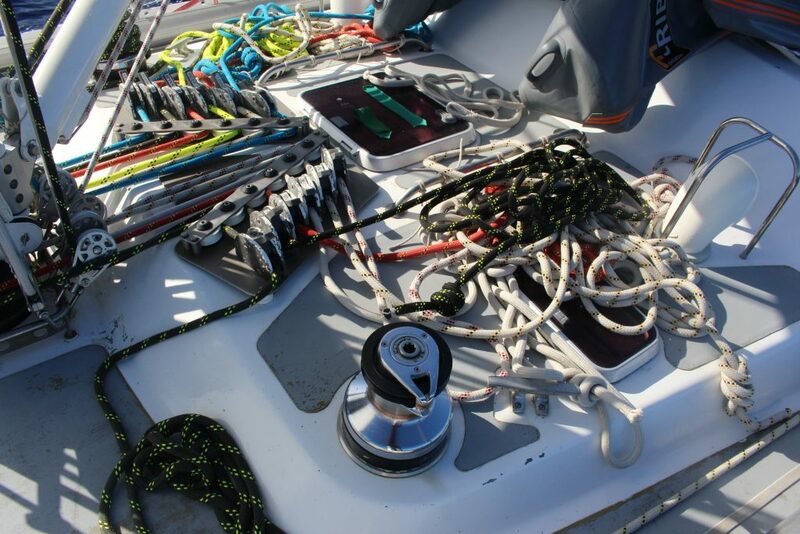 Not much fun to be on the controlling end of, or sitting in the nav station for, so we’ve been running a slightly erratic course to try and keep the boat powered up just enough to prevent this from happening. An additional 10kts of breeze would be my preferred option. Stars has renamed our spinnaker ‘The Hand Grenade’, as apparently helming it is like being given one to hold for an hour, and you just don’t know if it’s going to be you holding it when it finally goes off. Not a bad analogy really, and nicely in line with the kite’s existing handle of Jetsam, due to it’s propensity to spontaneously and unnecessarily throw itself into the ocean. Other than a stressful and fairly un-enjoyable time helming last night, we also had the mystery of the ‘bright yellow light on the horizon’. When properly offshore it’s unusual to see anything other than the lights of other ships, which on the whole are fairly distinct and definable. Land has its own distinct glow, and the coastal waters can sport a wide array of rigs, drill platforms, and fishing-related paraphernalia, all of which produce bright and wonderful lights to dazzle and bewilder the innocent sailor. 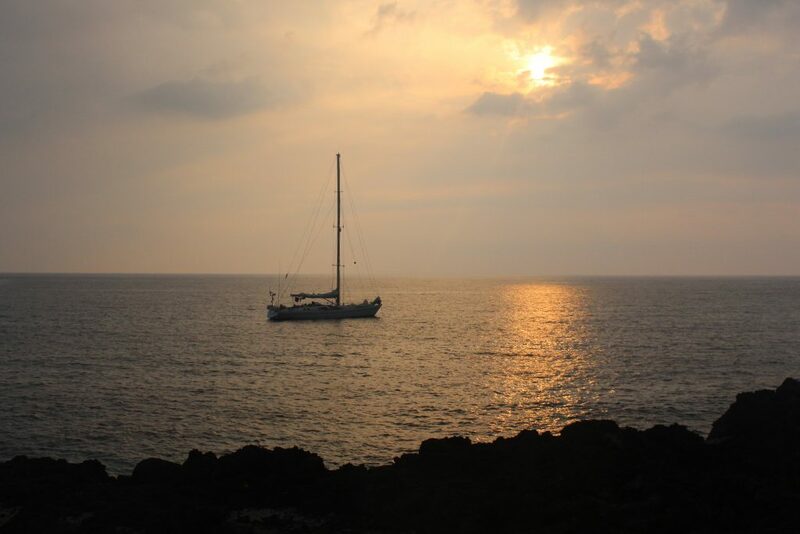 The middle of the Pacific does not normally deliver horizons ablaze in the same fashion, so the big yellow glow was deeply confusing. Nothing on RADAR, nothing distinguishable by eye or through binoculars, the wrong direction for anything celestial; just a pulsating ball of yellow light.